Today, at dawn, most of the team left, leaving Luke, Quyen, Axel and Alex feeling rather depressed. Despite, this we had to go back to work, as not everything had been finished on site, especially not the backfilling, of which there was still much to do. This was made much easier by super-strong volunteer Anna, who shovelled barrow-loads of soil all afternoon without any complaint. Without her we really would have been stuck. The re-burial of the site is a little depressing to watch. First we lay down a white ‘tessuto’ – compacted cotton wool , though it looks like snow – and then on goes the soil. What we dug disappears, and the site goes back somewhat to being what it was before – “a place where I used to have my picnic” – as one tourist put it, which we have somewhat productively disfigured. It is taking a while to pack everything up, managed mainly by Quyen, completing work done by Helen, Andy and Luke. We don’t know what company we will use to post back yet, but hopefully not DHL, as we wish no repeat of our earlier problems, when equipment was damaged and delayed in transit. Unfortunately Quyen and Luke have to leave before it is all finished, handing it on to Alex and Axel. At least they are buoyed by the positive comments of visitors from the German Institute, notably Professor Freiberger. The Italian diggers from the Sopraintendenza di Ostia seem also to be very enthusiastic, which provides encouragement to an exhausted stay-behind team. Despite our tiredness we have made some new observations during the day, thanks to ‘photo cleaning’ by Luke. Axel notes that we clearly have two levels of mortar in our NW corner are too, corresponding to different phases of forum paving probably. 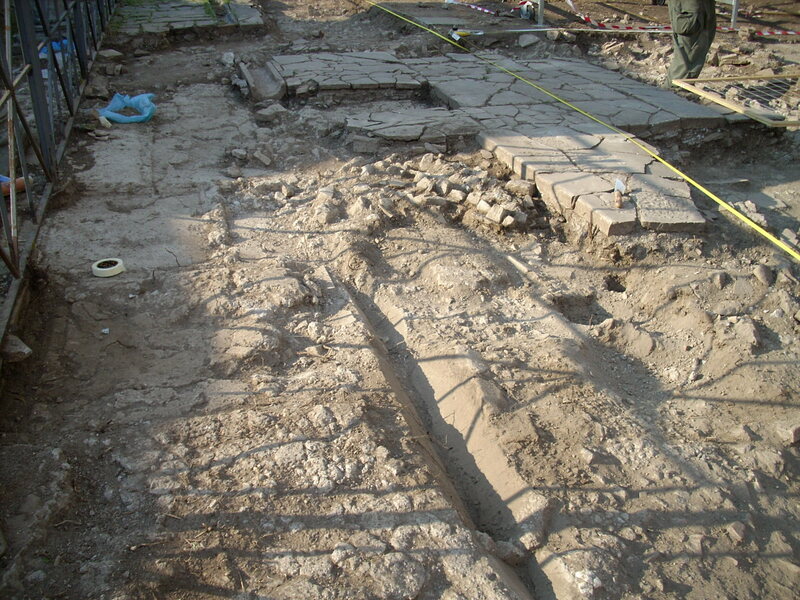 The foundation of the west colonnade is now clearer than ever, with an emplacement for a robbed column base being located and photographed.